Archaeologists surveying the waterways of suburban Seattle have made a discovery that’s likely the first of its kind in the region — an ancient tool-making site dating back more than 10,000 years. The find includes thousands of stone flakes, an array of bifaces, scrapers, and hammerstones, plus several projectile points, some of which were fashioned in a style that experts describe as “completely new” for this region and period in its history. The site was discovered along a creek in Redmond, Washington, under a layer of peat that was radiocarbon dated to about 10,000 years ago. And in the layer with the artifacts were burned bits of willow, poplar, and pine, which were themselves dated between 10,000 and 12,500 years ago. Together, these materials frame a period of prehistory in coastal Washington which archaeologists have not been able to explore before. While other sites in Washington’s lowlands have produced animal remains from the end of the last Ice Age, this is the first discovery of stone tools that date back more than 10,000 years, according to Dr. Robert Kopperl, lead researcher of the find. “It’s the oldest artifact assemblage from western Washington, and the excellent context in which we were able to do our excavations and sampling is now providing a picture, much clearer than ever before, of the environment these people were living in during the transition out of the Ice Age,” he said. Kopperl, from the firm SWCA Environmental Consultants, and his colleagues first made the find in 2008 while surveying a waterway known as Bear Creek, as part of a salmon habitat restoration project. Initial work turned up some stone artifacts above the layer of peat— a remnant of a time when the area was inundated with wetlands and lakes — which seemed to resemble a peat layer nearby that was about 3,500 years old. 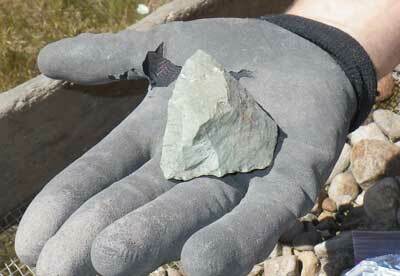 But radiocarbon results showed that the newly found peat was between 8,000 and 10,000 years old. The team then knew that it had a unique chance to plumb the depths of an important time in western Washington’s past, when the period marked by the last Ice Age — known as the Pleistocene — transitioned into the epoch in which we live today, called the Holocene. “This was the first opportunity anyone has had to conduct an archaeological excavation of a Late Pleistocene-Holocene transition lithic-bearing site in the western Washington lowlands,” Kopperl said. Once they picked up traces of human habitation older than any other found in the region, the researchers hoped to encounter artifacts that had never been found there before. “We figured once we began finding diagnostic artifacts that they would be different from those of the later local technological traditions,” he said. 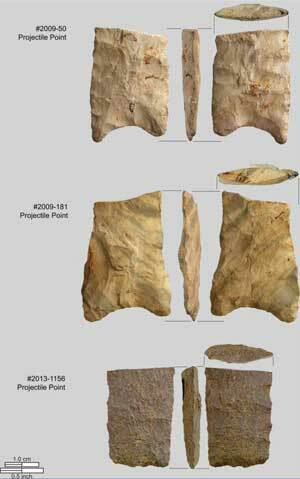 In all, six projectile points and base fragments were found at Bear Creek. 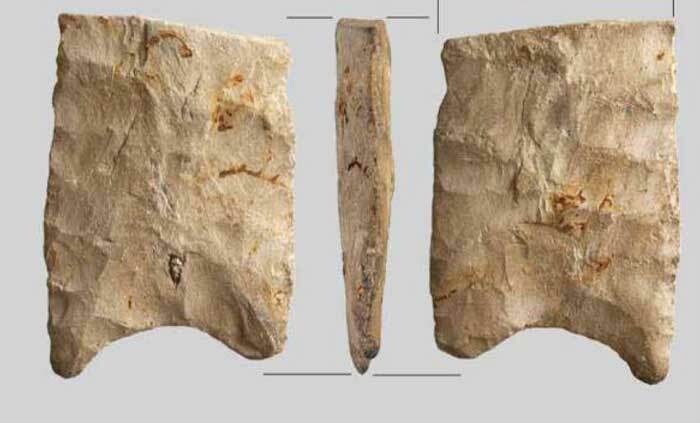 The two points with concave bases somewhat resembled Clovis points, which have been found elsewhere in the region but without clear archaeological contexts, Kopperl said. But rather conspicuously, both newfound artifacts lacked the distinctive fluting that’s typical of the Clovis style. Meanwhile, he added, a third point fragment was “reminiscent” of a style known as the Western Stemmed Tradition, which is typically found farther inland, in the interior Northwest and the Great Basin. “The concave-based points are different from any other forms found in western Washington, from any time period,” Kopperl said. As for the lifeways of the people who made and used these tools ten millennia ago, the clues are scant. Beyond that, there’s not much context to draw on in western Washington, Kopperl said, because no other artifacts have been found that date this far back in time. “There hasn’t been a formal technological tradition or culture-historical phase yet defined for this early time period in western Washington,” he said. In fact, he added, “there are probably other Late Pleistocene-Holocene sites preserved in similar modern settings in the Lowlands, and we should be on the lookout for them. “Also, this is confirmation that these kinds of sites do actually still survive in a rapidly developing place such as suburban Seattle,” Kopperl continued. “The old conventional wisdom amongst archaeologists regarding the western Washington lowlands was that this is an uninteresting place to study the earliest peoples, and a geographic ‘cul de sac’ in terms of larger patterns of Late Pleistocene-Holocene settlement and migration, and also that any such early remains in this area would not likely have survived the sea level rise of the early-mid Holocene or modern construction development. Kopperl and his colleagues report their findings in the journal PaleoAmerica. This find is significant in that it extends the known range of Clovis peoples, and should clear up some of the confusion within the archaeological community as to why Clovis sites have been found all over North and South America but very few along the coast. I have no doubt that many such sites exist, but with so many present-day cities along the coast it seems unlikely many of them would be found. Redmond is not “coastal” – it’s about 70 miles to the Pacific Coast. Why is it so odd that they’d be different from Clovis? They didn’t all migrate here all at once. It hasn’t been established that they all came from the same place or all at the same time or that they all shared the same technologies. It’s less than 15 miles from Puget Sound to this site, even if you go around Lake Washington rather than across. Bear Creek was an important salmon stream prior to the digging of the Ship Canal, and that valley was also a prime berry picking site. there were of course people living in there, at that time, and ever since then. we would have had fish camps, and they would have had winter housing, possibly longhouses. it was until about 250 years ago, that these many tribes with many members were removed out of their homes and away from their Fish camps. even just as recently as the 1950’s and1970’s Native Americans were still being relocated to their reservations. this is a fabulous find, and possibly a miracle that it was actually even found. considering all the development that has been going on in that area for the past 200 years. I’ve been in southeast Alaska for 50 years, I believe the natives along the coast were related, and their culture is wonderful. who said the points are Clovis? Looking like Clovis and are Clovis are two different ideas. The points look similar to a Plainview type, same as I recorded in NW Mexico.